Savor California had a booth in the Marketplace at the Susan Komen Breast Cancer Foundation’s Race for the Cure. Approximately 10,000 people attended this huge fundraiser to help in the fight against breast cancer -- race participants, family members and supporters. Offering tastes to support this very worthy cause were All Star Gourmet, Bellwether Farm, Mendocino Mustard, Porky’s Onions, Shelley’s Biscotti and Tulocay Made in Napa Valley. Shelley of Shelley’s Biscotti and Douglas of All Star Gourmet offer tastes to the crowd of health-conscious food lovers. The Marketplace attracted connoisseurs from throughout the Bay Area and across the nation to taste gourmet products, enjoy cooking demos, and meet chefs in a festive setting. 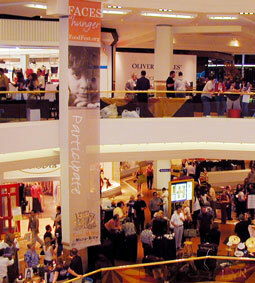 Proceeds benefited Copia, the American Center for Wine, Food and the Arts. The Savor California booth included California Vegetable Specialties, Carol Hall’s Hot Pepper Jelly, Henry’s Olives, La Tourangelle, Lodestar Farm, Mendocino Mustard, Sartain’s Menu, Shelley’s Biscotti, Terra Sonoma, the girl & the fig. Leslie Hall of Carol Hall’s Hot Pepper Jelly and a friend are ready to greet tasters at the Napa Valley Mustard Festival. 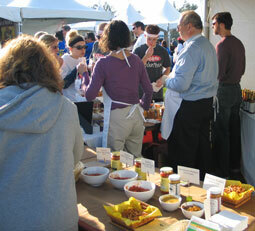 Seventy specialty food and beverage producers, as well as wineries from Savor California enthusiastically participated in this fundraiser for Slow Food USA by offering samples and selling their products. This highly influential group of fine food lovers was thoroughly impressed with the variety and quality of the products featured on Savor California. 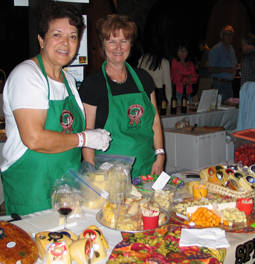 The ladies from Spring Hill Jersey Cheese prepare delicious pairings with a variety of cheeses. “Celebrating the Best of the West.” For this eighth annual Celebration Weekend, the Sunset property was transformed into a landscape of distinctive sights, sounds, and flavors that embodied the best of Western living. Declared by many attendees to be the best booth of the show, Savor California specialty food producers impressed the crowds for this two-day event. Offering tastes and selling their products were: A Perfect Pear from Napa Valley, Carvalho Fisheries, La Tourangelle, Lodestar Farm, Mendocino Mustard, O Olive Oil, Point Reyes Farmstead Cheese, Russo’s, Shelley’s Biscotti, Skipstone Olive Oil, and Terra Sonoma. Savor California was invited to be part of the Sonoma Tourism Council’s booth at this trade show for the San Francisco Concierge Association. Head concierges and their staffs from top San Francisco hotels were delighted to learn of a resource such as Savor California for visitors who want to buy local products. Costeaux French Bakery and Café, the girl & the fig, Spring Hill Jersey Cheese and Ace Cider provided the treats that tempted attendees to our table. Nine food producers from Savor California showcased their products at the spectacular Friday Auction and Festival: Fabrique Délices, Fiscalini Cheese, Jimtown Store, Lodestar Farm, Nana Mae’s Organics, Shelley’s Biscotti, Terra Sonoma, the girl & the fig, and Valley Fig Growers. Specialty food producers, 140 wineries and more than 30 top Napa restaurants served samples to a wine- and food-loving audience from all over the world. This 25th anniversary year, the world's most successful wine charity event raised $10.5 million for Napa Valley causes. 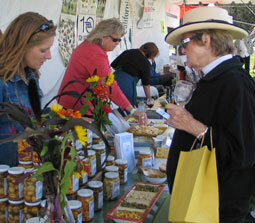 Barbara of the girl & the fig talks with an Auction Napa Valley guest. Savor California had a double booth in a location which gave us good visibility and plenty of space to accommodate eight Marketing Partners: LaLoo’s Goat Milk Ice Cream, McEvoy Ranch, Mendocino Mustard, Metromint, Rosie’s Kitchen, Russo’s, Santa Barbara Pistachios, Tulocay Made in Napa Valley. 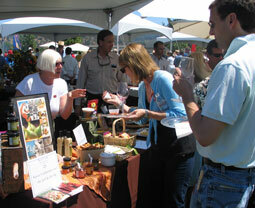 A story about Savor California was featured in the event’s magazine, Food Trade News. Kimberly Stern prepares to serve two flavors of Laloo’s Goat Milk Ice Cream: Scharffen Berger Deep Chocolate and Black Mission Fig. This was the 24th year for this prestigious wine and food event: a combination of the best wine varietals from premium wineries in Napa, Sonoma, and Mendocino Counties with gourmet food producers and top-notch Mill Valley restaurants. 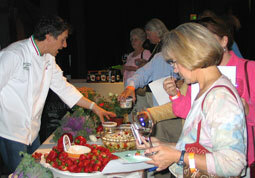 This event attracted an excellent crowd of true gourmet food fans. They were knowledgeable, interested and enthusiastic. 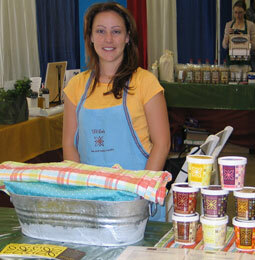 We were able to engage them and tell them about the products we were serving. They, in turn, gave us rave reviews on what they tasted. The Savor California booth included Kathy’s Gourmet Specialties' mustards, Meyenberg Goat Milk cheeses and butter, Nana Mae’s organic apple juice, Napa Tapas’ tapenades, O Olive Oil oils and vinegars, and Santa Barbara Pistachios. The event on the gorgeous Trinchero Family Estates grounds opened with a walk-around tasting to acquaint these food writers, restaurateurs, chefs and other food professionals with specialty products made by Savor California producers. The tasting included: Bellwether Farm, La Tourangelle, McEvoy Ranch, McFadden Farm, Nana Mae’s Organics, Redwood Hill Farm, Sartain’s Menu, Skipstone Ranch, Stella Cadente, Terra Sonoma, and the girl & the fig. Proceeds from ticket sales and the raffle raised money for C.H.E.F.S. (Conquering Homelessness through Employment in Food Service). The Society expressed appreciation to all the Savor California producers who donated so generously to the raffle. In addition to those who participated in the tasting, All Star Gourmet, Mendocino Mustard, Napa Tapas, O Olive Oil, Tulocay Made in Napa Valley, Santa Barbara Pistachios and Valley Fig Growers donated to the raffle. 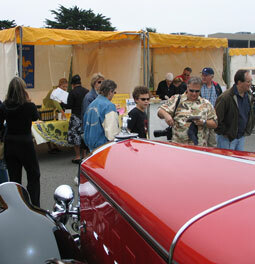 The Half Moon Bay Coastside Chamber of Commerce & Visitors’ Bureau presented the fourth annual classic car show with the theme, “A Celebration of Food, Wine, & Wheels.” Funds raised benefit the Chamber and the Chamber’s Scholarship Fund, Coastside Education and Senior programs. This scenic event took place ocean side on the spectacular grounds of The Ritz-Carlton, Half Moon Bay Golf Links. The specialty food and beverage producers from Savor California who participated were: Fall River Wild Rice, Fiscalini Cheese, Lodestar Farm, Nana Mae’s Organics, Porky’s Onions, Pt. Reyes Farmstead Cheese, Pt. Reyes Preserves, R. Genou California, Rosie’s Kitchen, Shelley’s Biscotti, TeaLeaf of Carmel, and The Chocolate Traveler. A great crowd of over 3,000 car lovers enthusiastically tasted and purchased. Nicole Johansson serves Lodestar Olive Oil, and Eileen and Nick Zaharioudakis serve Porky’s Onions across from a mint condition classic car. The Carmel TomatoFest featured a tasting of more than 300 tomato varieties from around the world, an extravagant outdoor BBQ, delicious tomato recipes created by 55 of America's best chefs, a tasting of 100 great wines from Monterey County, and the best of California gourmet specialty foods. 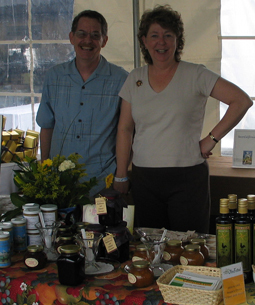 This was the 14th anniversary of this very successful event, which benefits local charities. The Savor California booth in the Marketplace offered tastes and products for sale made by California Vegetable Specialties, McEvoy Ranch, Meyenberg Goat Milk, O Olive Oil, Peanut Better, Pt. Reyes Cheese, Pt. Reyes Preserves, R. Genou California, Shelley’s Biscotti and Terra Sonoma. Julie serves Point Reyes Preserves' pickled vegetables. Shelly serves O Olive Oil's Blood Orange Olive Oil and O Porto Vinegar, and Susan serves California Vegetable Specialties' endive. The endive was topped with crumbled Pt. Reyes Farmstead Blue Cheese and drizzled with O Porto. Celebrity chef cooking demonstrations, cookbook author book signings and panel discussion, wine bar, and lots and lots of delicious specialty foods to taste and purchase – all combined with spectacular weather to make it a perfect day. Dedicated and fun-loving foodies wanted to learn about and purchase the products of Savor California Marketing Partners: Bovine Bakery, Brickmaiden Bread, California Vegetable Specialties, Fiscalini Cheese, Paul Thornton’s Smoked Salmon, Porky’s Onions, Skipstone Ranch, Stella Cadente, and Terra Sonoma Verjus. 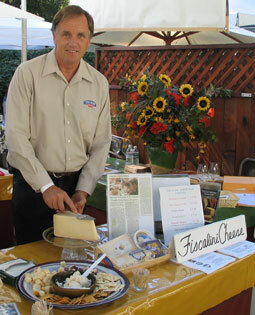 John Fiscalini served Fiscalini Cheese’s “Bandaged Cheddar” to a very appreciative crowd. Donsuemor Madeleines, Fall River Wild Rice, Fiscalini Cheese, Peanut Better, Russo’s Pesto, and Shelley’s Biscotti participated in this weekend of events, all devoted to fine food and wine. Shelley Fryer and John Patterson (in a Savor California "Foodie" t-shirt!) 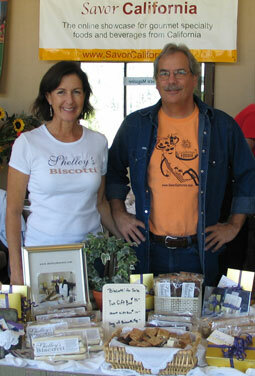 were ready to give out samples of Shelley's Biscotti. This benefit for Second Harvest Food Bank of Orange County featured gourmet specialty food producers, as well as Orange County’s finest restaurants, regional wineries, and microbreweries. A very engaged crowd of well over 2,000 of Orange County’s business leaders and residents attended, including many members of the Orange County Wine Society. They were knowledgeable and enthusiastic appreciators of the gourmet products offered by Bellwether Farm, Fall River Wild Rice, Meyenberg Goat Milk Cheeses, O Olive Oil, Peanut Better and The Chocolate Traveler. The crowd at the fundraiser for the Second Harvest Food Bank of Orange County.